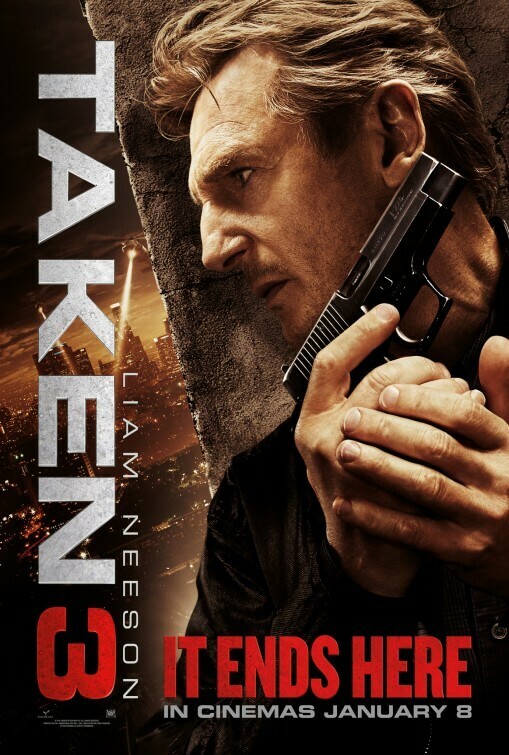 The opening line to the unnecessary sequel to the unnecessary sequel to the unlikely action hit is, “Honey, where’s my chequebook?” Telling words indeed, for the inclusion of a paycheque is likely the only reason why Liam Neeson has decided to return for a third time as Bryan Mills, the central figure in the Taken trilogy – because there’s certainly no artistic merit to be accomplished this time round. The series has had its ups and downs, with its okay first instalment gaining worldwide fans despite an unhealthy appetite for sadistic violence and unfortunate European stereotypes, and its sequel a couple of years later not faring any better with a rehashed storyline and further dive into nonsensical territory. The series is basically to action thrillers what the Hangover series is to comedy; a one-off that should have stayed a one-off, and gives its genre a bad name the more it continues. Also in common with Todd Phillips’ trilogy is how different a direction it wants to take for its third and presumably final film – there are lengthy pieces of dialogue near the beginning about how predictable characters have become and how they wish to become unpredictable once more, like we didn’t know before that they wanted to do something different this time – and, as a result, it ends up being the weakest and least satisfying of the series. What they have done with the plot this time, which sees Mills on the run after being framed for the murder of his wife Lenore (Famke Janssen, highly underused), is pump it with unfortunate clichés, and give it the same type of fugitive storyline found in much better films like, well, The Fugitive. Almost right away, we know who the main villain is going to be and what red herring will be placed before us to convince us otherwise, how the main hero is going to evade the police even when it looks like he’s giving in, et cetera. It doesn’t have the courtesy to do anything new with the material either, making all of it feel like a tired and dull re-tread of popular stories like this one; which, for a Taken movie, feels like part of the norm. Olivier “for the last time, I’m not a Decepticon” Megaton returns to the director’s chair after handling the production of the previous film, and somehow makes an even less competent action film than last time. From a headache-inducing opening credits sequence early on, Megaton seems to be a fan of both shaky-cam and slowed-down-then-sped-up editing because it’s all over the place in each action scene. It’s hard to figure out what’s even happening half the time because of these added elements, other than there’s things happening and Liam Neeson is somehow involved. It’s incredibly irritating to try and keep up with it all, and though it’s not as painful to watch as A Good Day to Die Hard or The Expendables 3 it’s still underwhelming action that sadly cannot pass for anything remotely engaging. Neither do we, in addition, care about who this is all happening to. The motivations of Neeson’s Mills have been questionable at best over this series, even coming off as dangerously overprotective and insecure at times, and in this film he makes some very dumb actions that push all of that a little more over the edge – for a guy who used to work in the CIA, he doesn’t seem very logical, does he? – so we’re just sat there watching some generic action hero do his thing for 108 minutes (which honestly feels a lot longer). Everyone else comes off as bland and uninteresting, but one that is worthy of mention is one of the main antagonists – no real reason why, honestly, other than he looks like a gangster version of Lloyd Christmas which is more off-putting and unintentionally funny than terrifying, and it’s hard to take him seriously when he looks like that. The biggest problem with Taken 3 is that it exists at all, and the same goes for Taken 2 from a few years ago. The first film, though met with mixed reviews initially, scored highly with audiences back in the day, probably because it was the first time people had seen a more serious actor like Liam Neeson do something more high-octane – there’s a reason why so many people remember that “particular set of skills” speech early in that film. Though it does have its flaws, it worked best as a one-off in the same way that Commando did for Schwarzenegger – and now, to see the studio milk the cow dry on two very lacklustre follow-ups, the appeal has definitely worn off by now with little chance of it appearing unique again. It would be a great shame, but let’s be honest: there was never anything to feel entirely proud of to begin with.